Be prepared to meet some of the nicest people ever. While dark skies and good weather are important, the people really make the difference and the Golden State Star Party is filled with really great people. Case in point: we hadn't been at the star party more than an hour last year when one of the attendees came over with a rope and helped us tie down our E-Z Up canopy. The skies really are dark – very dark – from horizon to horizon. Bring your own shade. If you don't bring shade, you won't have shade (unless you rely on the communal tent used for meals, etc.). Bring warm clothes for observing. We made a big mistake last year and didn't bring clothing that was warm enough. The temperature at night can be pretty cold. The shower truck was fantastic – yes, fantastic. The super friendly staff from Fireline Support Services of Northern California thoroughly cleaned each shower after every use. They did it quickly and efficiently and that's important when you have a line of people waiting. 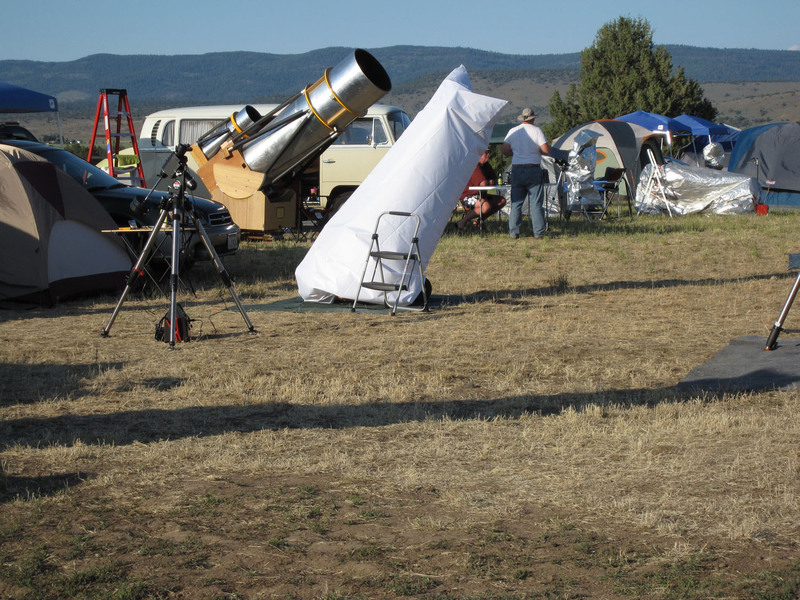 The Golden State Star Party is held at the Frosty Acres Ranch in North-Eastern California. The location has plenty of room for hundreds of people. It really is ideal for an astronomy star party. They have wireless internet access. I know this doesn't matter to some people. However, it makes a big difference to me and any one else "tethered" to their business. As the GSSP web site says, don't leave the kids at home. Last year there were many activities for children like kite flying and hay rides. Be sure to check out the Golden State Star Party (GSSP) web site for lots of good information! If you go, have a great time!